DVD to iPod Ripper is a powerful converter supporting DVD VOB IFO to iPod video format conversion. It helps you rip your DVDs to iPod 5G, IFO to iPod 5G (Supporting AVC H.264 for video). Supports ripping by custom file size. It allows you to choose an audio channel and subtitle to rip which is convenient when ripping multi-language movies. 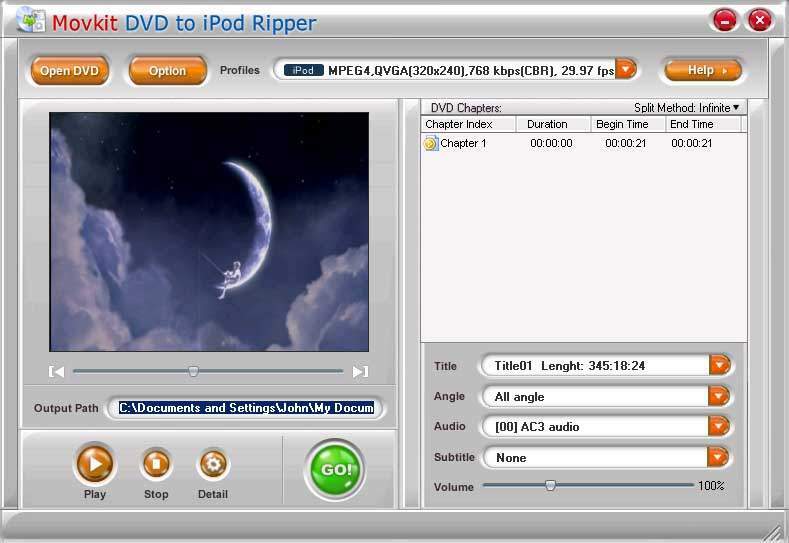 DVD to iPod Ripper works with all popular video and audio formats. With it, you can convert the following types of files: DVD, VOB, IFO to iPod. Your video can be saved as: iPod Video formats. Backup DVD Disk(.VOB) to iPod formats. Backup DVD Disk(.IFO) to iPod formats. User-friendly Profile:Just select a profile from the drop-down menu and save as the high quality output video file. Convert CSS-encrypted perfect quality DVD movies. 5Star DVD to iPod Ripper is the new released DVD to iPod ripping software. Rip DVD to ipod iPhone MP4 or H.264 video format. Qweas is providing links to DVD to iPod Ripper 1.8.20060316 as a courtesy, and makes no representations regarding DVD to iPod Ripper or any other applications or any information related thereto. Any questions, complaints or claims regarding this application DVD to iPod Ripper 1.8.20060316 must be directed to the appropriate software vendor. You may click the publisher link of DVD to iPod Ripper on the top of this page to get more details about the vendor.